Overview - The release is cause for celebration amongst Purple fans due to the rarity of material. Extensive interviews with keyboardist Jon Lord and bassist Glenn Hughes tell the tale of a band caught by circumstance into one of its most controversial, extreme and exciting eras of its long career. Ian Gillan and Roger Glover were gone. A young unknown singer by the name of David Coverdale was recruited as was bassist Hughes. The results were the albums Burn and Stormbringer (both released in 1974). But then Ritchie Blackmore left the band. Against all odds, they rocked on, recruiting Tommy Bolin (from Zephyr and The James Gang). The album Come Taste The Band (1975) documents the short-lived Bolin era, an era that all came crashing down when the band announced in July of 1976 that it was breaking up. By December, Bolin would be dead due to a heroin overdose. Nine years of silence would ensue. 'Deep Purple: Phoenix Rising' is a double feature look at the Mark IV iteration of the popular English rock band. Infamous for an ever-changing roster of band members, the group has managed to endure throughout the years by reinventing themselves and their musical styles, to both the delight and dismay of fans. Included on this Blu-ray are 'Deep Purple Rises Over Japan,' a rare thirty minute concert film, and a recently produced documentary 'Gettin' Tighter,' which chronicles the band's transition to their Mark IV lineup and their subsequent dissolution. Recorded in 1975 at the Budokan Hall in Japan, this previously unreleased concert film features only five performances. The tracks included are: "Burn," "Love Child," "Smoke On The Water," "You Keep On Moving," and "Highway Star." With a runtime of only thirty minutes, this is a pretty slim but rare look at this version of the band in action. The Mark IV lineup on display here features lead vocalist David Coverdale, bassist Glenn Hughes, guitarist Tommy Bolin, drummer Ian Pace, and pianist Jon Lord. The band members are all decked out in classic seventies' regalia with tight, bell bottomed pants, and unruly, long hair. Despite their flashy appearance, the performance doesn't offer much to get excited about. The film goes headfirst into the music with little to no fanfare. The band takes an occasional break between tracks to introduce the next number or thank the audience but for the most part this is a no thrills straight forward concert. The music itself is pretty standard rock material, and the tracks can seem a bit redundant and indistinct. The band also lacks charisma and stage presence, leading to an unengaging and forgettable show. Even the group's rendition of one of their most popular songs, "Smoke On The Water," lacks energy and oomph. After watching the included documentary, and seeing many of the traumatic events which led up to this concert, the band's lackluster effort makes perfect sense and is definitely understandable. Still, the tumultuous circumstances don't make the material any better. The filmmakers use a standard shooting style, covering the band members from a variety of angles that are inter-cut with shots of the enthusiastic Japanese audience every now and then. Some occasional flashing lights, lens flare, and twirling, shaking camera movements add a little bit of kinetic flavor to the proceedings, but by and large, this is pretty basic stuff. In fact, the most amusing part of the entire concert is when a Japanese fan rushes the stage and security members scramble to get him off. 'Deep Purple Rises Over Japan' is a short and mediocre concert that doesn't offer much value, but fans of the band may still appreciate the rare footage, especially considering its place sandwiched between various harrowing events in their rough history. Also, be sure to keep an eye on guitarist Tommy Bolin's hand while playing, as the subsequent documentary reveals a pretty interesting tidbit regarding his performance. 'Gettin' Tighter' is a sporadically interesting eighty minute look into the formation and eventual destruction of Deep Purple's Mark IV iteration. Told through recent talking head interviews with Jon Lord and Glenn Hughes, as well as archive footage of various performances and further interviews, the documentary paints a sometimes tragic picture of the highs and lows of rock star life. 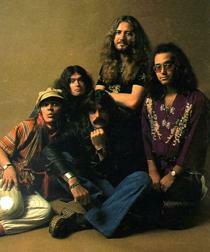 The film starts off detailing the band's transition from Mark III to Mark IV, covering the loss of vocalist Ian Gillan and guitarist Richie Blackmore. Some archive footage of Blackmore's crazy on-stage antics reveal a much more lively stage presence in the band's earlier roster than the one featured in the included concert film. Details are given tracing the events which led to the hiring of new singer David Coverdale and American guitarist Tommy Bolin. The documentary then provides a fairly straightforward account of the band's tours, performances, and albums, spanning the Mark IV years, all through snippets of concerts and interviews. Unfortunately, the vast majority of this content isn't terribly stimulating or interesting, and even fans may be turned off by the mundane and sometimes amateur editing and presentation. Thankfully, the doc does find some life when it shifts its focus to the band's inner demons, chronicling both Glenn Hughes and Tommy Bolin's descents into drug abuse. Hughes provides a very personal and open discussion of his past problems that reveal a Felliniesque world of circus freak drug dealers and guitar cases full of cocaine. His frank stories provide an intelligent and insightful commentary on the pitfalls of the rock star environment. The most interesting part of the feature involves the band's infamous and tragic trip to Jakarta, Indonesia. The events that transpired during their concert and stay in the city are almost unbelievable, leading to the mysterious murder of one of the band's security members, an instance which saw dogs unleashed on an unsuspecting audience, and thousands of dollars siphoned from the band by crooked promoters. Hughes is still shocked that they made it out of the country alive. 'Gettin' Tighter' isn't always very interesting, and the presentation itself leaves a lot to be desired. Fans of the band may find a lot to like in the archive footage and revealing interviews, but most viewers probably won't find much value here. 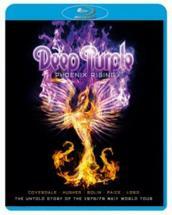 'Deep Purple: Phoenix Rising' is brought to Blu-ray by Eagle Rock on a single BD-50 disc housed in a standard case. A ten page booklet is included in the package with some background information on the concert, details on the Blu-ray features, and photos of the band. Both films are provided with a 1080p/AVC transfer. 'Deep Purple Rises Over Japan' is featured in the 1.33:1 aspect ratio and 'Gettin' Tighter' is primarily in the 1.78:1 aspect ratio with some occasional 1.33:1 footage as well. Neither effort looks particularly good, but most of their faults simply lie in the inherent limitations of their sources. The concert film was shot in 16mm and the print is in fine shape with some occasional speckles throughout. Grain is visible but the image is very soft, hazy, and flat. Colors are decent, with some strong red, pink, and yellow hues flashing on stage, but nothing ever really pops. Black levels are good but a little crushed and contrast is fine. The video seems to accurately represent the original photography, but is still underwhelming all across the board. The documentary is cobbled together from a variety of sources including HD video, SD video, and various film formats. Just about every video artifact under the sun rears its ugly head at some point in the presentation, with occasional to frequent aliasing, pixilation, macro blocking, and noise. At its worst, the material featured looks like low quality streaming video. This is completely understandable for a lot of the archive footage, but even the newly recorded interviews look pretty bad, exhibiting artifacts and lacking detail. Color, black levels, and contrast all vary depending on the source elements, but as a whole never look very good. Both films included offer extremely mediocre video presentations. While most of the quality problems may just be inherent to the sources, there are also several issues which could seemingly have been corrected or mitigated. Audio for the concert is presented in both English DTS-HD Master Audio 5.1 and 2.0 tracks. Audio for the documentary is provided in an English DTS-HD Master Audio 2.0 track along with optional English, French, German, and Spanish subtitles. 'Rises Over Japan' features clean, deep vocals and some nice separation between musical elements across the speaker channels. Surround use is also good, with rears effectively giving space to crowd reactions and faint music cues. Dynamic range is pretty flat, however, and bass is disappointingly subdued, giving the track a surprisingly weak low end. Balance is handled well, with all of the elements mixed in good harmony. Like its video presentation, the documentary's audio features material from a variety of sources, and thus its quality differs slightly throughout. For the most part though, the presentation is clean and serviceable, with no major signs of crackle, hiss, or pop. Dialogue in the various interviews is always easy to hear and two channel separations during the archive performance clips are handled well. Again, dynamic range and bass are still fairly subdued, but the music performance snippets shine through regardless. None of the tracks here are all that impressive, but they serve the material just fine and the concert audio does offer a mostly pleasing and even occasionally immersive listening experience. The Official Soundtrack and More - Eight digitally remastered live audio tracks are included from performances in Japan and Long Beach for a total of 1 hour and 10 minutes of material. The tracks are: "Burn (Long Beach)," "Gettin' Tighter (Japan)," "Love Child (Japan)," "Smoke On The Water/Georgia On My Mind (Japan)," "Lazy (Long Beach)," "Homeward Strut (Long Beach)," "You Keep on Moving (Japan)," and "Stormbringer (Long Beach)." They all sound good in their DTS-HD Master Audio 2.0 presentations but three of the performances are simply audio only repeats of those found in the concert film. Jakarta, December 1975 (HD, 7 min) - This featurette includes audio interviews with Jon Lord and Glenn Hughes about their hellish experience in Jakarta set to archive footage of their trip. Unfortunately, all of the audio here is identical to the material already included in the main documentary, making this a pretty useless addition. Come Taste The Band (HD, 19 min) - Extended interviews from the documentary are featured, with the participants elaborating on the development of their album "Come Taste The Band." While some material is repeated from the feature, most is new with several more stories about the creation of certain tracks set to new bits of archive footage. 'Deep Purple: Phoenix Rising' is a mediocre collection of a disappointing but rare concert film, and a fairly standard but amateur documentary. Video and audio presentations leave a little to be desired and extras include a lot of repeated material. Fans of the band may find a lot to like about this disc, but those unfamiliar should probably just move along.